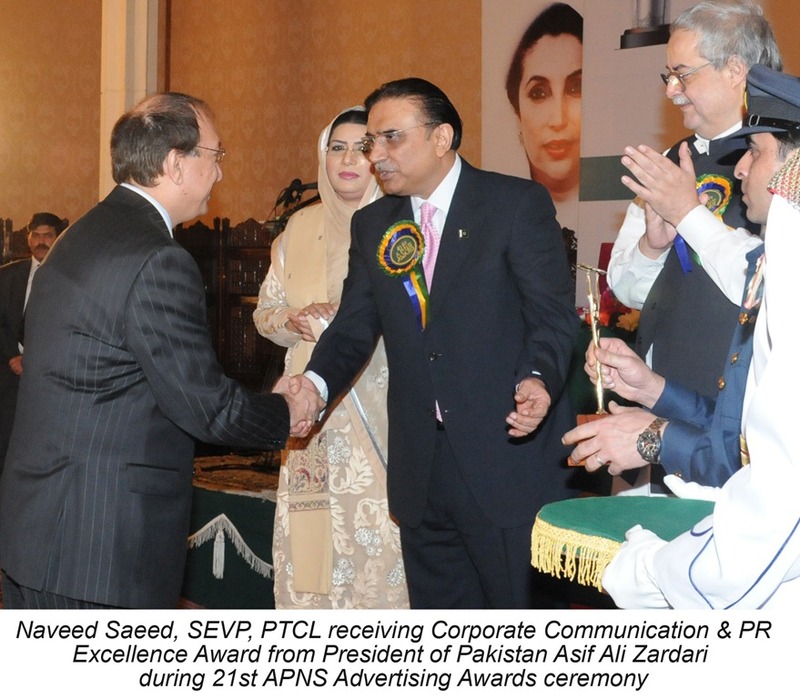 Naveed Saeed, Senior Vice President at PTCL, has won Presidential Award for Excellence in PR and Corporate Communications in an APNS Awards ceremony held recently. Awards Ceremony was held on March 28, 2011 at President House, Islamabad wherein awards were distributed by the President of Pakistan, Mr. Asif Ali Zardari among the winners of journalist and advertising agencies awards. A statement issued by the APNS said that the President APNS, Mr. Hameed Haroon decided that the Presidential Award for Excellence in PR and Corporate Communications be awarded to Mr. Naveed Saeed, Senior Executive Vice President, Pakistan Telecommunications Co. Ltd.
Best Cartoon, Abdul Karim Rathore, Daily The News Int’l. Naveed Saeed, SEVP Commercial, Pakistan Telecommunication Company (Pvt) Limited won the Best Corporate Communications and PR Award at the 21st All Pakistan Newspapers Society (APNS) annual awards ceremony held here at the President House. The prestigious award was conferred to him by the President of Pakistan, Asif Ali Zardari. Naveed Saeed is the Senior Executive Vice President-Commercial of Pakistan Telecommunication Company Limited. He is responsible for most of the revenue streams of the company which include PSTN, Broadband, Wireless and Corporate business, Carrier services and International business. His portfolio also includes PTCL’s Marketing and Corporate Communications Department. Previously he has served as the Operational Head of Business Zones (North) for Punjab, Khyber Pakhtunkhuwa & AJK/FANA at PTCL Under his leadership the zones showed significant improvement in all areas of the business. He has given PTCL a new direction, especially in areas of business development and network rehabilitation, which has set a benchmark in improving the existing performance. Naveed Saeed has a rich profile in the telecom sector spanning over a period of nineteen years. He has been a star performer throughout his career holding leadership positions at the most prominent telecommunications companies across South Asia, Africa and the Middle East such as PTCL, Warid Telecom (the Abu Dhabi Group), IMTCL, (Thuraya project), Mobilink, (an Orascom Telecom GSM Company formerly a Motorola GSM company), Instaphone, Pakcom Limited (subsidiary of Millicom AMPS) and Paktel Limited (a Cable and Wireless company now a China Mobile company).Naveed Saeed has always given prime focus on his relationship with the media and has taken keen interest in regularly highlighting PTCL’s achievements and business developments by sharing them with the press. In critical situations, such the employees’ strike last year, his crisis communication management and positive media engagement draw special attention and appreciation, in particular from the telecom, media and PR industry. Commenting on his achievement, Naveed Saeed expressed his profound happiness and joy and said that he was proud to be part of the top management of one of the best corporate entities of the country. PTCL takes great care of its relationship with all its stakeholders at all levels and enjoys extraordinary rapport with the media. He thanked all the newspapers, TV channels, magazines and especially all telecom reporters from across the country for their overwhelming support for him to highlight PTCL’s achievements and their positive criticism to improve its products and services. He said that he takes immense pride in his relationship with the media. He also thanked his team and PR agency for their exceptional support which, he said, has enabled him to achieve this great recognition by APNS in the shape of its Best Corporate Communication and PR Award.